^ a b Orosei, R. et al. (25 July 2018). “Radar evidence of subglacial liquid water on Mars”. Science. doi:10.1126/science.aar7268. http://science.sciencemag.org/content/early/2018/07/24/science.aar7268.full 2018年7月25日閲覧。. ^ Wilson, R.; Richardson, M. (2000). “The Martian Atmosphere During the Viking I Mission, I: Infrared Measurements of Atmospheric Temperatures Revisited”. Icarus 145: 555–579. Bibcode: 2000Icar..145..555W. doi:10.1006/icar.2000.6378. ^ Liu, J.; Richardson, M. (August 2003). “An assessment of the global, seasonal, and interannual spacecraft record of Martian climate in the thermal infrared”. Journal of Geophysical Research 108 (8). Bibcode: 2003JGRE..108.5089L. doi:10.1029/2002je001921. ^ Clancy, R.. “An intercomparison of ground-based millimeter, MGS TES, and Viking atmospheric temperature measurements: Seasonal and interannual variability of temperatures and dust loading in the global Mars atmosphere”. Journal of Geophysical Research 105 (4): 9553–9571. Bibcode: 2000JGR...105.9553C. doi:10.1029/1999je001089. ^ Bell, J.. “Mars Reconnaissance Orbiter Mars Color Imager (MARCI): Instrument Description, Calibration, and Performance”. Journal of Geophysical Research 114 (8). Bibcode: 2009JGRE..114.8S92B. doi:10.1029/2008je003315. ^ Bandfield, J. (2013). “Radiometric Comparison of Mars Climate Sounder and Thermal Emission Spectrometer Measurements”. Icarus 225: 28–39. Bibcode: 2013Icar..225...28B. doi:10.1016/j.icarus.2013.03.007. ^ Byrne, Shane; Ingersoll, AP (14 February 2003). 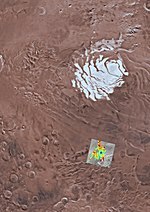 “A Sublimation Model for Martian South Polar Ice Features”. Science 299 (5609): 1051–1053. Bibcode: 2003Sci...299.1051B. doi:10.1126/science.1080148. PMID 12586939. ^ Philips, R. J. et. al (2011). “Onset and migration of spiral troughs on Mars revealed by orbital radar”. Science 332 (13): 838–841. Bibcode: 2011Sci...332..838P. doi:10.1126/science.1203091. http://www.sciencemag.org/content/332/6031/838.full. ^ Kolb, Eric J.; Tanaka, Kenneth L. (2006). “Accumulation and erosion of south polar layered deposits in the Promethei Lingula region, Planum Australe, Mars”. The Mars Journal (Mars Informatics Inc.) 2: 1–9. Bibcode: 2006IJMSE...2....1K. doi:10.1555/mars.2006.0001. ^ Mangold, N. 2011. Ice sublimation as a geomorphic process: A planetary perspective. Geomorphology. 126:1-17. ^ Kieffer, Hugh H.; Christensen, Philip R.; Titus, Timothy N. (30 May 2006). “CO2 jets formed by sublimation beneath translucent slab ice in Mars' seasonal south polar ice cap”. Nature 442 (7104): 793–796. Bibcode: 2006Natur.442..793K. doi:10.1038/nature04945. PMID 16915284. http://www.nature.com/nature/journal/v442/n7104/abs/nature04945.html 2009年9月2日閲覧。.